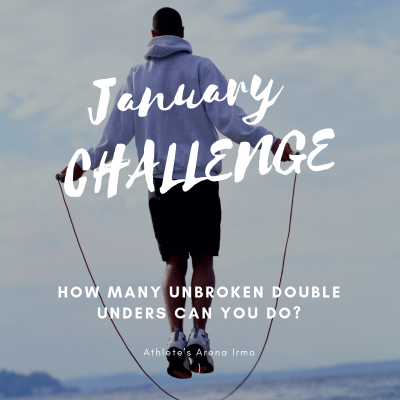 January’s challenge of the month is max unbroken double unders. The truth about double unders is that they aren’t easy to do. They cause a patient person to become impatient. Frustration is inevitable. They have been called an elusive skill by many. DUs take the right jump rope – a rope at the right length, with the right handles, and the right thickness of cable. And sometimes the right song playing in the gym. There’s no magic potion to getting double unders. They just take practice. So, find a corner in the gym and practice for 5-10 minutes before or after your workout. With practice and patience, you may just find yourself getting better at this elusive skill.